Posted on Tue, Oct 18, 2011 : 7:18 a.m. 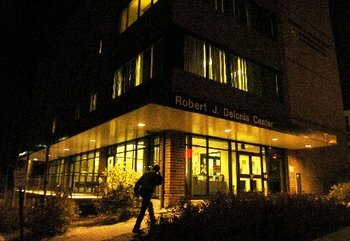 The Delonis Center's overnight warming center will be able to stay open this winter after the Ann Arbor City Council agreed Monday night to chip in $25,000 in funding. Up until now, it had been uncertain whether the Shelter Association of Washtenaw County, which operates the homeless shelter, was going to be able to keep the program going. Representatives of the organization told AnnArbor.com last week dozens of homeless people in the Ann Arbor area would be left to fend for themselves during bitter cold nights this winter if the shelter couldn't find donations to run the overnight warming center. But counting the money pledged from the city, plus funds committed from other sources, it now appears the warming center, 312 W. Huron St., will have the $80,822 it needs for 30 full weeks of operation, said Ellen Schulmeister, the shelter's director. The Shelter Association of Washtenaw County will be able to operate its overnight warming center at the Delonis Center this winter thanks to funding from the city and other partners. Since 2009, the Shelter Association has had about $409,000 cut from its budget and is facing a $320,000 deficit this year, agency officials told AnnArbor.com last week. Through a coordinated funding process earlier this year, the city and other funding partners — including Washtenaw County — collectively gave $207,551 to the Shelter Association for its residential program plus another $59,563 for its non-residential program. That money was part of more than $4.4 million provided to 40-plus local nonprofit agencies. But the county's budget for the new fiscal year starting Jan. 1 proposes a $455,538 cut in human services funding — down from $1.46 million. That includes reducing funding for the Delonis Center from $160,000 to $25,000, while the coordinated funding for human services would drop from $1 million to $886,462. Mayor John Hieftje said he understands the county faces financial troubles, but he called the proposed cuts concerning. He said he's in talks with county officials, stressing that both the city and county need to maintain human services funding. "We look at that as a partnership that we've had with the county," he said. "We've been holding up our end of it, and we're going to be asking them to hold up their end." The resolution to provide $25,000 for the warming center was sponsored by Hieftje and Council Members Sandi Smith, Sabra Briere and Stephen Rapundalo. Schulmeister said the county isn't among the donors that have stepped forward to help keep the warming center open this winter, though she said an organization closely connected with the county has tentatively agreed to help chip in toward the costs. Council members heard a report from Schulmeister and Julie Steiner, executive director of the Washtenaw Housing Alliance, at the start of Monday's meeting. "Thank you from the Shelter Association and the Delonis Center for all of your current and past support," Schulmeister told council members. "It has always meant a lot to us." Schulmeister said her organization, like a lot of other nonprofits, is feeling the pinch with funding being reduced at a time when need is high. "The Shelter Association has lost about $400,000 in funding while costs continue to go up," she said. "We have found ourself in the position of having to cut staffing to two vital programs that we have been running for the last several years." She said that includes the warming center and the rotating shelter program. Thanks to congregation volunteers provided through a local religious coalition for the homeless, she said, her organization is able to continue the rotating shelter program. Schulmeister said the Shelter Association attempted to utilize volunteers for the warming center but was unable to formulate a workable plan with various volunteer groups. She said that's primarily because the warming center requires overnight awake support. She said the Housing Alliance asked the Shelter Association to try to find the funds to support the warming center program for one more year. In the meantime, a number of local service providers, including the Shelter Association under the leadership of the Housing Alliance, plan to convene a special group to find a more supportable program to help temporarily house homeless people during the winter months in the future, Schulmeister said. "As of right now, we don't know what that solution is going to be, but we're going to be working on it diligently in the next year," she said. Steiner said the Shelter Association has been doing the community a huge favor for years by providing the rotating shelter program and the warming center as overflow. She commented on the financial commitment needed to run good programs like those. "We worked so hard in Washtenaw County to make sure that we didn't have any shelters that were just what's known as 'mission shelters' — so, in the vernacular, 'three hots and a cot,'" Steiner said. "We made sure that the shelters that we run in Washtenaw County have programs and social workers and case managers, and help and food, and everything else to keep people whole and to help them move out of homelessness into housing." Steiner said communities with mission-style shelters can more easily fill emergency needs because they're not staffing and providing a full range of services. "They're just providing beds and a warm place to stay," she said. "So what we know is we need to resolve this as a community. This is not the shelter's problem. This is all of our problem, and we're going to pull together a group of agencies in the community." A breakdown of the costs for the warming center shows it will cost $63,353 over 30 weeks to pay the wages of two operations assistants on 12-hour shifts, seven days per week, at $12.57 per hour. Another case manager making $15.96 per hour is expected to work 20 hours per week. Related payroll taxes and benefits come to $7,293, while laundry will cost $600. Wed, Oct 19, 2011 : 4:29 p.m.
Good News! But a previous article stated that the then unfunded proposal for this year's Warming Center had far fewer beds than last year. How many beds are expected? It seems odd that this wasn't included in the article. Mon, Oct 24, 2011 : 11:21 p.m. I was told that there will only be room for 25 in the warming center this year. Wed, Oct 19, 2011 : 4:25 p.m. The warming center is an important community resource. However, is anyone monitoring that the additional services being provided over/above nutritious hot meals and a warm place to sleep are providing assistance that actually helps reduce homelessness or helps homeless people address more effectively the many challenges they face. Hopefully one thing that we all are learning in this challenging economy is to insist that what we spend money for is actually providing an important service. Agreed also that our city officials, in the choices they are making about how to spend public funds, seem very out of touch with the challenges that most folks are facing in this economy in Michigan. In these challenging times, cities (and states) that make more intelligent choices about investing in long-lasting important infrastructure rather than on short-term PR and fluff will find themselves in a much better situation when the economy finally begins to improve. It is quite instructive to drive down I-75 from Toledo to Cincinnati, where road construction is happening at every major interchange and many minor ones, either improving the interchange or adding lanes or resurfacing the road--Ohio seems to have chosen to put its citizens back to work (presumably with federal highway dollars) rebuilding its central interstate corridor. Folks in Ohio government apparently made some very far-sighted decisions that will have cascading benefits for Ohio for many years to come--and perhaps also cascading consequences for neighboring states that were not able to pull it together to make such far-sighted decisions. Tue, Oct 18, 2011 : 9:31 p.m.
Tue, Oct 18, 2011 : 6:51 p.m. According to the SAWC's Annual Reports in 2009 their revenue was $2,320,439 and in 2011 their revenue (excluding HPRP) was $2,624,953, which by my math is an increase of about $304,000. So why does the article state they cut $400,000 from their budget? Tue, Oct 18, 2011 : 6:04 p.m.
Tue, Oct 18, 2011 : 4:28 p.m. The money is not there for the shelter because when people would donate by the way of donations from their work, when the news letter would come the donation amount and the persons name was not there. This has been going on since the worker at the Delonis Center stop working there, by the name of Jarrid. He was wonderful at making sure that people would get their name in the news letter. Also when they have a fund raising event, they only cater to the wealthy and not the every day working people, maybe they are finding out that people other than the Doctors in Ann Arbor do donate and others would like to go to the fund raising other than the Medical doctors in Ann Arbor. Wed, Oct 19, 2011 : 2:47 p.m.
thecompound, I think what sciomanone1 is saying is that there was more consistent recognition of donors when Jared was development director. Also, that the fundraising events used to be more accessible to &quot;everyday people,&quot; but the minimum donation now to attend the events is so high it prohibits anyone other than those of relatively high income (such as doctors) from attending. Tue, Oct 18, 2011 : 7:20 p.m. I am not sure what you are saying. Are you saying people only donate when they see their name in a newsletter? And why are non-medical people not allowed to go to fundraisers? Tue, Oct 18, 2011 : 4:06 p.m.
Amy police and firefighters save lives, the shelter is more like an enabler. But I do agree with your point about calenders and art. Tue, Oct 18, 2011 : 3:43 p.m.
City officials, please explain to me why the city can print calendars and buy artwork for beautifying the city...but can't sufficiently fund a warming center for our homeless? Please take a look at your cellphone. I'll wait. Done? Yes. EVERY CELLPHONE HAS A CALENDAR. Close to every person you know has a cellphone...or computer. We do NOT need to mail a free calendar to every A2 citizen! What on EARTH were you thinking spending that kind of money? And while I love art, and my mother is an artist... I would rather save a life than fund public art. We are in dire straits right now. This is NOT the time to buy artwork. Please get our priorities straight.